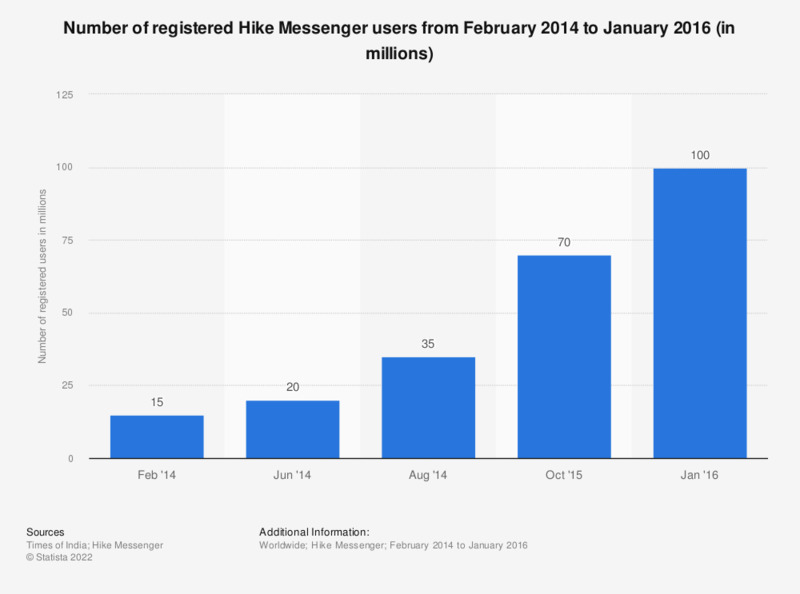 This statistic presents the number of registered Hike chat app users from February 2014 to January 2016. As of that month, the mobile messenger hat 100 million registered users worldwide. Instant messaging has been gaining popularity in the last years thanks to the rise of mobile internet and smartphone growth. Mobile messenger apps offer an alternative to SMS texting, and enhance user experience by providing social media features and other elements. The number of mobile messaging users is forecast to grow from 1.4 billion in 2015 to more than two billion users in 2019. By that year, it is expected that nearly 70 percent of mobile phone internet users will make use of mobile phone messaging apps to communicate. While Facebook-owned Whatsapp is a clear industry leader with one billion monthly active users as of April 2016, other services, such as LINE and Hike messenger, have been gaining space in the global market of mobile messenger app. Launched in 2012, Hike messenger is a cross-platform for instant messaging and SMS communication. The service was developed by Bharti Softbank, a company composed of a partnership between India-based Bharti Telecom and the Japanese company Softbank telecom. Aside of instant messaging, Hike messenger offers unique features such offline chat and unlimited free SMS to differentiate its services from the competitors. The number of Hike messenger users has been constantly increasing over the years, going from 15 million in February of 2014 to a high of 100 million registered users in January of 2016. With this constant growth, Hike established itself as the third most popular Asia-based mobile messenger app, only behind Chinese app WeChat and NHN Japan's LINE app. Hike is particularly popular in India; the social network registered a penetration rate of eight percent in the country in the fourth quarter of 2015, the same rate in India as Twitter. Facebook leads the Indian market with 13 percent penetration rate. Figure for February 2014 comes from an earlier publication.